In the wastes of Mordor, the dark lord Sauron plots to cast the lands of Middle-earth into eternal darkness. He only lacks the One Ring, an artifact of ultimate power... and it hangs around the neck of a humble and unassuming hobbit, Frodo Baggins. From the Shire, Frodo and his companions plan their perilous route. He must bring the One Ring to Mount Doom, deep in the lands of Mordor. To be sure, Sauron’s forces, including nefarious orcs, sinister black riders, and formidable flying nazguls, will be hunting Frodo all the while. But he isn’t alone. The powerful Gandalf, valiant Aragorn, loyal Sam, and many others will help him on his journey, and are prepared to pay the ultimate price to ensure that Frodo destroys the One Ring and brings peace back to Middle-earth! 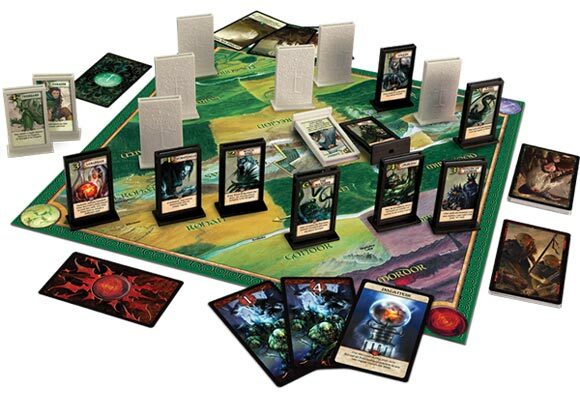 Lord of the Rings: The Confrontation is a two-player board game set in J.R.R. Tolkien’s beloved setting of Middle-earth, in which one player controls of the Fellowship of the Ring, and the other player control of the forces of Sauron. Each side has nine units at its disposal, with varying strengths and abilities, and each player has cards that augment his or her units’ strength values. Additionally, the identity of a player’s units is hidden from his opponent through the use of plastic character stands. 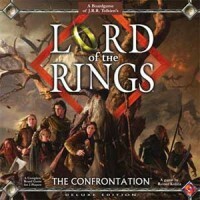 Add a Review for "Lord of the Rings: The Confrontation – Deluxe Edition"